The invention provides an encapsulated cell system comprising at least one capsule, each capsule comprising a core containing a cellular source of a biologically active molecule and a surrounding biocompatible jacket, the jacket permitting diffusion of the biologically active molecule, wherein the biologically active molecule is selected from the group consisting of hormones, cytokines, growth factors, angiogenesis factors, antibodies, lymphokines, enzymes, neurotransmitters, neurotrophic factors, anti-inflammatory agents, and combinations thereof and wherein the system is adapted for implantation into the aqueous and vitreous humor of the eye. The invention also provides for the use of this system in the manufacture of a medicament for the delivery of the biologically active molecule into the aqueous or vitreous humor of the eye. This invention relates to preparing encapsulated cells for implantation in a host by exposing the cells, either in vivo or in vitro, to one or more restrictive conditions that more closely match those at a desired implantation site for a sufficient period of time to establish a desired cell property in response to the restrictive condition. Encapsulated cells which produce a biologically active molecule, when implanted in a host, may be used to prevent or treat many diseases or disorders or to provide, restore or augment one or more metabolic functions in the host. One approach to encapsulating cells is called "microencapsulation", wherein tiny spheres encapsulate a microscopic droplet of a cell-containing solution (Sefton et al., Biotechnology and Bioengineering 29, pp. 1135-1143 (1987); Sugamori et al., Trans. Am. Soc. Artf. Intern. Organs 35, pp. 791-799 (1989)). Another approach to encapsulating cells, "macroencapsulation", involves encapsulating a. plurality of cells in a thermoplastic capsule. Typically this is accomplished by loading cells into a hollow fiber and then sealing the extremities. Various types of macrocapsules are known in the art. In particular, Dionne et. al. (WO 93/19195) refers to a macrocapsule having cells dispersed in a matrix and a semipermeable surface jacket, and is incorporated herein by reference. See also Aebischer, U.S. patents 5,158,881, 5,283,187 and 5,284,761 which refer to a cell capsule formed by co-extruding a polymer solution and a cell suspension. Typically, when the cells used for encapsulation and implantation are isolated directly from tissue (primary cells), they are disaggregated, washed, and then encapsulated. See, e.g., Aebischer et al., Trans. Am. Soc. Artif. Intern. Organs, 32, pp. 134-7 (1986); Altman et al., Diabetes, 35, pp. G25-33 (1986); Chang et al., US 5,084,350); Darquay and Reach, Diabetologia, 28, pp. 776-80 (1985); Sugamori and Sefton, Trans. Am. Soc.Artif. Intern. Organs, 35, pp. 791-9 (1989). When immortalized cells or cell lines are to be encapsulated and implanted, they are typically isolated from nutrient-rich cultures. See e.g., Aebischer et al., Biomaterials, 12, pp. 50-55 (1981); Experimental Neurology, 111, pp. 269-75 (1981) (dopamine-secreting PC12 cells), and Ward et al, wo 93/22427 (IgG-secreting MOPC-31C cells). Encapsulated cells are usually incubated in vitro and functionally characterized before implantation. Encapsulated cells are often cultured in a defined medium during this pre-implantation stage. Often the medium is a balanced salt solution lacking nutrient additives (e.g. Aebischer, supra; Altman, supra; Chang et al., supra). Alternatively, encapsulated cells are incubated in a nutrient medium such as RPMI 1640, which contains various amino acids, vitamins, inorganic salts and glucose (2 g/L; 11.11 mM) (Animal Cell Culture, Eds. Pollard and Walker, Humana Press Inc., Clifton, New Jersey, pp. 696-700 (1990)), and is typically supplemented with 5%-15% fetal calf or horse serum. Cells that are encapsulated and implanted in a host must undergo at least two severe changes in nutrient conditions as compared to in vitro conditions. The first occurs upon encapsulation. Compared to in vitro conditions, cells in an encapsulated environment are nutrient depleted. This depletion is manifested in two ways. There is a nutrient gradient between the external environment and capsule interior which naturally forms across the membrane. This gradient is further accentuated because molecules do not diffuse freely between the outside host tissue and the cells at every position within the capsule. Cells closer to the capsule surface have preferential access to nutrients diffusing across the capsule jacket. In addition, waste products of cells closer to the capsule surface are more readily eliminated. A second severe change in the concentration of nutrients, e.g., oxygen and glucose, occurs upon implantation in a host. This is because in vitro oxygen and at least some other nutrient levels are generally much higher than occurs in vivo. Thus the driving force for diffusion of these molecules into the capsule is diminished in vivo. These changes in the nutrient environment may result in an alteration of one or more cell properties. For example, cell death or reduced long term cell viability can result. In addition, the change in environmental conditions upon implantation may also affect other properties of remaining viable encapsulated cells, such as cell growth rate or the cells' ability to produce a biologically active molecule. Changes in the growth rate of discrete subpopulations of cells may result in a takeover of the capsule by a faster growing subpopulation of cells, potentially leading to an apparent shift in the capsule output characteristics, or other potentially undesirable effects. One important difference between in vivo implantation conditions and in vitro conditions is the glucose concentration to which the cultured cells are adapted. Another difference between conditions in tissue culture and those at an implantation site is the amount of oxygen available to the cells. Other nutrients may be at significantly different concentrations in culture medium and at a given implantation site. Cells or tissues that are highly active metabolically are particularly susceptible to the effects of nutrient and oxygen deprivation (hypoxia). Likewise, many endocrine tissues that are normally sustained by dense capillary beds and are thus acclimated to growth in high oxygen and nutrient levels in vivo exhibit this behavior; pancreatic islets of Langerhans and adrenal chromaffin cells are particularly sensitive to hypoxic shock. Changes in oxygen tension and nutrient stress are known to alter the expression of a large number of genes that affect a variety of cellular functions. Such changes can affect the stability and function of certain mRNAs. For example, the tyrosine hydroxylase mRNA, which encodes the enzyme that catalyzes the rate limiting step in dopamine production, may be affected by nutritional stress. Further, various heat shock genes, and the expression of metabolic enzymes like those involved in intermediary metabolism (e.g. the glycolytic and gluconeogenic pathways) may be affected by low glucose or amino acid levels. Importantly, highly-differentiated cell types that are deprived of oxygen can love their tissue-specific functions until they recover from hypoxic shock, [see, e.g., Wolffe and Tata, FEBS Letters, 176, pp. 8-15 (1984)]. Functions that are lost or diminished include the synthesis and modification of proteins. This may affect the production and secretion of the very therapeutic factors that cells are intended to supply to the surrounding host tissue. In addition, hypoxic conditions can in some cases initiate malignant transformation, (see, e.g., H. Goldblatt et at., Biochemical Medicine, 7, pp. 241-52 (1973)). It is desirable to develop a method for implantation involving exposing or acclimating cells to one or more restrictive conditions prior to implantation to reduce alterations in cell properties resulting from the effect of the change in environmental conditions upon implantation, and thus reduce any adverse consequences to the host. It is also desirable to develop cell lines of the cells so prepared. It is also desirable to provide a means for ex vivo study of cells which have undergone changes in the in vivo environment. This invention relates to a method for implanting encapsulated cells in a host involving exposing the calls, either in vitro or in vivo, to one or more restrictive conditions for a sufficient period of time to establish a desired cell property in response to the restrictive condition prior to implantation at an implantation site in the host. Preferably, the cell property established by the methods of this invention is substantially maintained following implantation. The encapsulated cells produce a biologically active molecule which may be useful in preventing or treating a disease or disorder, or in providing, restoring or augmenting a metabolic function in the host. Cells produced according to this invention may also be useful for in vitro applications, for diagnostic or other purposes. Figure 1 shows NGF secretion from encapsulated BHK cells incubated in vitro at 50 mmHg in media containing 0.8 g/l glucose (LOW O2/gl). BHK cells were encapsulated in hub-sealed Type 4 double skinned capsules. NGF secretion per capsule per 24 hours, indicated by the height of the bars, was assayed at days 3, 7, 14, 21 and 28. Figure 2 shows encapsulated BHK cells incubated in vitro at 142 mmHg in media containing 5.5 g/l glucose (HIGH O2/gl). BHK cells were encapsulated in hub-sealed, Type 4 (T4) capsules and NGP secretion per capsule per 24 hours, indicated by the height of the bars, was measured at days 3, 7, 14, 21 and 28. Figure 3 shows NGF secretion from encapsulated BHK cells incubated in vitro in LOW O2/gl media, as in Figure 1, over time in hub-sealed, Type 4 (T4) capsules made from either (a) 10% PAN/PVC, (b) 12.5% PAN/PVC, or (c) 15% PAN/PVC. NGF secretion per capsule per 24 hours, indicated by the height of the bars, was measured at days 3, 7, 14, 21 and 28. Figure 4 shows release of norepinephrine (NE) and epinephrine (EPI) as a function of oxygen pressure by encapsulated adrenal chromaffin cells cultured in vitro for 14 days at 20, 40, 60, 80 or 140 mmHg O2. Release was measured at day 2 and day 14. Panel A shows basal NE release; panel B shows K+-evoked NE release; panel C shows basal EPI release, panel D shows K+-evoked EPI release. Figure 5 shows release of catecholamines by calf adrenal chromaffin cells encapsulated in Type 2 capsules, prior to implantation and following retrieval after a 6 week implantation period. Panel A shows the basal release of NE and BPI before and after the implantation period. Panel B shows that nicotine-stimulated release of NE and EPI before and after the implantation period. Panel C shows the K+-evoked release of NE and EPI before and after the implantation period. Figure 6 shows release of catecholamines by calf adrenal chromaffin cells encapsulated in Type 4 capsules, prior to implantation and following retrieval after a 6 week implantation period. Panel A shows the basal release of NE and EPI before and after the implantation period. Panel B shows that nicotine-stimulated release of NE and EPI before and after the implantation period. Panel C shows the K+-evoked release of NE and EPI before and after the implantation period. Figure 7 shows basal (A) and nicotine stimulated (B) catecholamine output by encapsulated calf adrenal chromaffin cells prior to implantation and following retrieval after a 6 month implantation period in the spinal subarachnoid space in rats. Figure 8 shows release of dopamine and L-dopa by encapsulated PC12 and PC12A cells prior to implantation and following retrieval after a 3 month implantation period in rat striatum. Panels A and B show pre-implant basal output for PC12 and PC12A cells, respectively. Panels C and D show post-explant basal output for PC12 and PC12A cells, respectively. Figure 9 compares catecholamine output of cells acclimating in vivo to normal or lowered dopamine levels caused by 6-hydroxy-dopamine (6-OHDA) lesions in rat substantia nigra. Panel A shows the basal rate of L-dopa output from PC12 cells as a function of acclimation time in vivo in either lesioned (hatched bars) or non-lesioned (open bars) areas of the substantia nigra. Panel B shows the ratio of basal L-dopa to dopamine output rates as a function of acclimation time in vivo in either lesioned (hatched bars) or non-lesioned (open bares) areas of the rat substantia nigra. Figure 10 shows catecholamine output from encapsulated PC12 cells as a function of the time of acclimation (in months) in vivo in primate brains. Open squares represent basal L-dopa, and open circles represent basal dopamine levels. Figure 11 shows the rate of NGF output from pre-implant and 14 month post-implant BHK-hNGF clone 23 cells encapsulated in HF 120794-9 single-skinned fibers in Vitrogen® matrix or no matrix. Cell Bank (CB) cells are non-acclimated BHK-hNGF clone 23 cells. A "cell property" includes any phenotypic property that can be measured, including cell viability, growth rate, and cellular production of a biologically active molecule. A desired cell property can refer to a change in the level of production of one or more biologically active molecules in response to the restrictive condition, or a change in the output ratios of two biologically active molecules. In addition, the desired cell property can refer to stabilization of output of a biologically active molecule in response to the restrictive condition. The term "restrictive condition" means that or.e or more conditions in which the cells are normally or optimally cultured in vitro has been altered to more closely match the actual or expected condition in vivo at the desired host implantation site. A "biologically active molecule" is one which may (a) function within the cell in which it is made (e.g. bcl-2 to prevent apoptosis), (b) be expressed on the cell surface and affect the cell's interactions with other cells or biologically active molecules (e.g. a neurotransmitter receptor or cell adhesion molecule), or (c) be released or secreted from the cell in which it is made and exert its effect on a separate target cell (e.g. a neurotransmitter, hormone, growth factor, cytokine, or other transducer of intra-or intercellular signalling). The biologically active molecules may be useful in treating or preventing a disease or disorder in the host, or may provide, restore or augment one or more metabolic functions in the host. The term "host" or "recipient" refers to an appropriate animal subject, including mammals and particularly human subjects. The term "recipient" refers to an animal in which cells are exposed to one or more restrictive conditions such that the cells exhibit a desired cell property. The term "host" refers to an animal in which the encapsulated cells that exhibit the desired cell property are implanted. The term "cells" refers to cells in any form, including but not limited to cells retained in tissue, cell clusters, and individually isolated cells. The cells in the present invention produce a biologically active molecule. The cells may be primary cells or dividing cells that naturally produce the biologically active molecule, or have been genetically engineered to do so. "A biocompatible capsule" means that the capsule, upon implantation in a host mammal, does not elicit a host response sufficient to detrimentally affect the capsule function or to render it inoperable. Such inoperability may occur, for example, by formation of a fibrotic structure around the capsule limiting diffusion of nutrients to the cells therein. Detrimental effects may also include rejection of the capsule or release of toxic or pyrogenic compounds (e.g. synthetic polymer by-products) from the capsule to surrounding host tissue. "An immunoisolatory capsule" means that the capsule upon implantation into a mammalian host minimizes the deleterious effects of the host's immune system on the cells within its core, such that the capsule functions for extended periods of time in vivo. The term "hydrogel" means a three dimensional network of cross-linked hydrophilic polymers. The network is in the form of a gel substantially composed of water, preferably but not limited to gels being greater than 90% water. Cross-linked hydrogels can also be considered solids because they do not flow or deform without appreciable applied shear stress. In one embodiment, cells are encapsulated in a biocompatible capsule and are exposed to one or more restrictive conditions in vitro before implantation at an implantation site in a host. The cells are exposed to the restrictive condition or conditions for a sufficient period of time to establish a desired cell property in response to the restrictive condition. Preferably the cell property is substantially maintained following implantation of the encapsulated cells at an implantation site in the host. The restrictive conditions contemplated include alteration in one or more of the following: the temperature, pH, or the barometric pressure, or in the effective concentration of one or more metabolites or cofactors, including but not limited to a sugar, alcohol, carboxylic acid, amino acid, fatty acid, nucleic acid, gas, metal ion or any other biological actor which contributes to the growth, function or viability of the cells, such that the alteration more closely matches the in vivo conditions at the desired implantation site. In addition, the restrictive conditions can also alter the effective concentration of one or more biologically active molecules, including but not limited to a hormone, growth factor, neuro-transmitter, cytokine, or other biologically active factor which participates in intra- or intercellular signalling. It will be appreciated that some nutrients and biologically active factors may be present at a lower concentration in vivo than normally encountered in vitro. Alternately, some nutrients and biologically active factors may be present at a higher concentration in vivo than normally encountered in vitro. In addition, the restrictive conditions contemplated by this invention include exposing the encapsulated cells, either in vivo or in vitro, to target cells from a chosen implantation site to produce the desired cell property in the encapsulated cells. See, e.g., Wainer and Heller, "Neuronal Hybrid Cell Lines: Generation, Characterization and Utility", in Neuronal Cell Lines, J. Wood [Ed], IRL Press., p. 20 (1992). Any suitable culture media can be used with the methods of this invention. One of ordinary skill in the art can modify a defined minimal tissue culture medium to achieve a desired concentration of a nutrient of critical gas or other restrictive conditions that characterize a desired implantation site, When cells are exposed to the restrictive conditions in vitro, the culture conditions may be slowly and continuously altered, or may by altered by one or more step changes to reach the desired restrictive condition. In a preferred embodiment, cells are exposed to one or more restrictive conditions in vivo by implanting them into a recipient at a chosen implantation site. The molecular environment in the vicinity of the chosen implantation site can affect the properties of cells implanted and acclimated at that site. For example, the concentration of one or more biologically active factors (e.g. hormones, growth factors, neurotransmitters or cytokines), can influence the ability of the implanted cells to grow, to acclimate by adapting gene expression profiles for survival at that site, or to produce the desired therapeutic factors. Once the cells have been exposed to the restrictive conditions in vivo for sufficient time to exhibit a desired cell property, the cells are retrieved and can be implanted in a host. We prefer exposure to the restrictive conditions in vivo because the desired target cell property exhibited by the cells is established by adjustment of all cellular phenotypic traits concurrently to the restrictive conditions. In contrast, acclimation or exposure to the restrictive conditions in vitro may result in establishment of some desired cell properties. However, when these cells are implanted in the host, other cell properties may be altered and affect the desired established target cell property or properties. Preferably, the recipient and the host are both primates, most preferably the host is human. Preferably the implantation site in the host is the same as in the recipient. Cells prepared in vivo according to this embodiment may also be maintained under one or more restrictive conditions and used in vitro for diagnostic or other purposes. In another embodiment, cells are exposed to multiple restrictive conditions in vitro before encapsulation. Preferably, the cells are then encapsulated and exposed to additional restrictive conditions prior to implantation in the host. Exposure to one or more restrictive conditions prior to encapsulation enables one to choose the surviving cells from the initial population and encapsulate only those cells. If the cells used are post-mitotic or otherwise non-dividing cells, the cells may be chosen from the initial population based on their apparent health, and phenotype, preferably as measured by production of the desired biologically active molecule. If the cells used are actively dividing cells, the surviving cells typically will overgrow the initial population. The time sufficient to establish the desired cell property in response to the restrictive condition will vary according to the cell used, as well as the restrictive conditions. Typically cells will undergo a transition period when initially exposed to the restrictive condition or conditions, during which time the cell phenotype continues to change until the cell property becomes established in response to the restrictive condition. The time required for the transition can be determined by routine experimentation. In a preferred embodiment, baby hamster kidney cells (BHK cells) genetically engineered to secrete nerve growth factor (NGF) are suspended in a collagen/Vitrogen® matrix and encapsulated in hollow, semi-permeable fibers sealed at their ends. Preparation of such BHK-hNGF cells has been described, e.g., in PCT/US94/09299, incorporated herein by reference. Capsules are acclimated in vitro to low oxygen and low glucose conditions and the amount of NGF released from the capsules assayed as a function of in vitro acclimation time. The rate of NGF production per capsule increases with time of in vitro acclimation (Fig. 1). In another preferred embodiment, encapsulated BHK-hNGF cells are implanted into the lateral ventricles of a host and acclimated in vivo. Capsules are explanted, the acclimated cells removed and grown by repeated passaging, and then re-encapsulated for implantation of in vivo acclimated cells into the recipient. Capsules with non-acclimated or in vivo acclimated cells are assayed for NGF release before re-implantation, and at various times after re-implantation in the recipient (Fig. 11). In another preferred embodiment, PC12 cells encapsulated in single-skinned semi-permeable membranes are exposed to in vivo restrictive conditions for 6 months in primate brains. After the 6 month implantation period, the cells exhibit a desired cell property in response to the restrictive conditionsi.e., the cells exhibit changed production of neurotransmitters, as measured by the ratio of basal release of L-dopa to dopamine, as well as changes in the relative output of other catecholamines compared to pre-implantation levels (Fig. 7). In another preferred embodiment, PC12 cells are encapsulated and acclimated in vivo in substantia nigra brain regions having either normal dopamine levels, or having reduced dopamine levels unilaterally induced by prior administration of 6-hydroxydopamine (6-OHDA). PC12 cells acclimated in vivo for 28 or 60 days produce higher levels of L-dopa than those acclimated for shorter times. Cells acclimated in vivo in the presence of normal dopamine levels produce higher ratios of L-dopa to dopamine when re-implanted into a recipient than do cells acclimated in 6-OHDA lesioned substantia nigra with reduced dopamine levels (Fig. 9). In another embodiment, adrenal chromaffin cells encapsulated in double skinned semi-permeable membranes are exposed to in vivo restrictive conditions for 55 and 84 days in humans, in the subarachnoid space. After the implantation period, the cells exhibited changed production of neurotransmitters. A number of different implantation sites are contemplated. These implantation sites include the central nervous system, including the brain and aqueous and vitreous humors of the eye. Preferred sites in the brain include the striatum, the cerebral cortex, subtbalamic nuclei and nucleus Basalis of Meynert. Other preferred sites are the cerebrospinal fluid, most preferably the subarachnoid space and the lateral ventricles. This invention also contemplates implantation into the kidney subcapsular site, and intraperitoneal and subcutaneous sites, or any other therapeutically beneficial site. In some cases it may be useful to modify the implantation site prior to or concurrent with in vivo acclimation to create an optimal environment. For example, a known model for Parkinson's disease involves administration of 6-hydroxydopamine in the brain substantia nigra. This toxin is selective for dopaminergic neurons. Cells may be implanted and acclimated in this lesioned area. PC12 cells -- which secrete chatecholamines when implanted into such a lesioned brain -- show an overall increase in catecholamine output after about 1 month in vivo. In addition, the ratio of catecholamine species changes, with the ratio of basal L-dopa to dopamine decreasing after about 14 days in vivo. The local environment varies between implantation sites and between different species. It is likely that the local environment of any given implantation site will vary between individuals of the same species. In general, the metabolite and gas concentrations present in a given implantation site can be approximated from published information or can be determined by one of ordinary skill in the art without undue experimentation. For example, in humans, it is known that typical partial pressures of oxygen in the body range from about 90 mmHg in arterial blood, to less than 1 mmHg in working muscle tissue. Other typical oxygen pressures are: venous blood (40 mmHg), peritoneal cavity (47 mmHg), and cerebrospinal fluid (59 mmHg). Molecules including glucose, amino acids, lactate and ribonucleosides are transported across the blood-brain barrier into the CSF to supply CSF-bathed areas such as the ventricles, the sub-arachnoid space and the spinal canal. Galactose concentrations are typically ten-fold higher in the CSF, and pyruvic and lactic acids are more concentrated in the CSF than in blood plasma. In contrast, most amino acids are 5 to 30 times more concentrated in blood than in the CSF (See Geigy Scientific Tables, vol. I, supra, p. 169). Other "micronutrient" substances such as vitamin C, folaces (vitamin B-complex members), deoxyribonucleosides, and pyridoxine (vitamin 86) are actively transported across the blood-brain barrier into the CSF. In addition, concentrations of ions such as sodium, potassium, calcium, magnesium and chloride are strictly regulated in the CSF (Spector and Johanson, cientific American, pp. 68-74 (November 1989)). The metabolites present in culture media are typically chosen to optimize cell growth and viability in tissue culture. The concentration of these compounds deviates from those present at a given implantation site. Often the cells are grown in concentrations of salts and glucose that are higher than those found at desirable implantation sites. For example, RPMI 1640 media contains 11.1 mM glucose, whereas glucose levels are about 4.5 mM in the blood serum and only 2.2-3.9 mM in the CSF. Similarly, calcium levels in RPMI 1640 are 0.42 mM, whereas calcium levels are 1.2 mM in the CSF and 2.44 mM in the blood serum (Table 1). And zinc ions are present at 0.5 µM in the CSF, 16.7 µM in the blood serum, and absent from RPMI 1640 medium. In addition, most cells are cultured in vitro at ambient oxygen levels (142 mmHg) or in incubators with ambient humidified air and 5%-7% CO2 (e.g. Aebischer et al., Bio-materials, supra; Ward et al., supra). This may be significantly higher than the oxygen concentration present in vivo at the chosen implantation site in the host. Further, all tissue culture media lack ephemeral molecules that are present in vivo. These ephemeral molecules are rapidly degraded and are constantly synthesized or replenished in vivo. Some culture media are supplemented with heat-inactivated fetal calf or horse serum to replace some substances, but ephemeral molecules are also generally low or absent in serum. When supplemented with serum, typically less than 20% of the total medium is serum, thus those molecules will be present at best at only one-fifth of the concentration found in serum. In addition, serum-supplemented culture media may contain molecules that do not occur in a discordant host and that may have undesirable effects on the encapsulated cells. Finally, while serum concentrations of most components is reflectiwe of their concentration in the interstitial fluid, concentrations of specific substances may be significantly different between the serum and the interstitial fluid. The cells used in this invention may be allogeneic to the host (i.e., from the same species as the host) or xenogeneic to the host (i.e., from a different species). We prefer implanting cells in a xenogeneic host. It will be appreciated that preparing cells for implantation in a xenogeneic host will likely involve different restrictive conditions than for an allogeneic host, and may produce a phenotypically different population of cells, with different cell properties. The cells may be prepared either from a donor (i.e., primary cells or tissues, including adult, neonatal, and fetal cells or tissues) or from cells which replicate in vitro such as immortalized cells or cell lines, including genetically modified cells. Primary cells can be from non-dividing (post-mitotic) normal tissue, from naturally-dividing (mitotic) cells such as those in the liver, or from pluripotent stem cells like those of the spleen and the bone marrow. Mitotically active cells obtained in vivo can also be from cancerous cells (tumor cells). Primary cells that may be used according to the present invention include growth factor-responsive neural progenitor stem cells derived from the CNS of mammals [Reynolds and Weiss, Science, 255, pp. 1707-10 (1992); Richards et al., Proc. Natl. Acad, Sci. USA, 89, pp. 8591-95, (1992); Ray et al., Proc. Natl. Acad. Sci. USA, 90, pp. 3602-06, (1993)], primary fibroblasts, Schwann cells, astrocytes, β-TC cells, Hep-G2 cells, ATT20 cells, oligodendrocytes and their precursors, myoblasts, myotubes, adrenal chromaffin cells or tissue of the adrenal medulla. We prefer neural stem cells and adrenal chromaffin cells. Schwann cells, also preferred, may be prepared according to the method of Bunge (PCT published application WO 92/03536). Encapsulated Schwann cells may be implanted in appropriate areas of the brain to prevent the degeneration of the dopaminergic neurons of the nigral striatal pathway associated with Parkinson's disease. Generally, the preferred implant site will be in or near the striatum. Encapsulating the cells may enhance secretion of trophic factors since the cells will not be in proximal contact with neurons, and myelination will not occur. other glial cell types may be encapsulated and implanted for this purpose, including astrocytes and oligodendrocytes. Techniques for isolating cells or tissues that produce a selected product are known, or can be adapted from known procedures. For example, islets of Langerhans can be isolated from a large-animal pancreas (e.g., human or porcine) using a combination of mechanical distention and collagenase digestion, as described by Scharp, et al., U.S. Patent No. 4,868,121, Islets may be isolated from small animals such as rats by the method of Scharp, et al., Diabetes 29, suppl. 1, pp. 19-30 (1980). Similarly, hepatocytes can be isolated from liver tissue using collagenase digestion followed by tissue fractionation, as described by Sun. et al., Biomat. Art. Cells, Art. Org., 15, pp. 483-496 (1987). Adrenal chromaffin cells may be isolated by known methods [Livett, Physiology Reviews, 64, pp. 1103-61 (1984); Sagen et al., U.S. Patent 4,753,635]. Immortalized cells can be from primary sources, or can have been selected from cells transformed with viruses, viral gene products, oncogenes, or other immortalizing genes or gene products. Examples of publicly-available cell lines suitable for the practice of this invention include: baby hamster kidney (BHK), chinese hamster ovary (CHO), mouse fibroblast (L-M), NIH Swiss mouse embryo (NIH/3T3), African green monkey cell lines (including COS-a, COS-7, BSC-1, BSC-40, BMT-10 and Vero), rat adrenal pheochromocytoma (PC12), PC12A, rat glial tumor (CS) cells, RAJI (human lymphoma) cells, MOPC-31C mouse plasmacytoma cells, MN9D, MN9H cells and ripTAg transgenic mouse derived cells. We prefer BHK and PC12 cells. Techniques for cell immortalization are described in Land et al., Nature 304, pp. 596-602 (1983) and in Cepko, Neuron 1, pp. 345-353 (1988). Candidate cell lines include genetically engineered beta-cell lines which secrete insulin such as NIT cells (Hamaguchi, et al., Diabetes 40, p. 842 (1991)) and RIN cells (Chick, et al., Proc. Natl. Acad. Sci. USA, 74, pp. 628-632 (1977)), ATT cells (Hughes, et al., Proc. Natl. Acad. Sci. USA, 89, pp. 688-692 (1992)), CHO cells (Matsumoto, et al., Proc. Natl. Acad. Sci. USA, 87, pp. 9133-37, (1990)), and β-TC-3 cells (Tal, et al., Mol. Cell Biol., 12, pp. 422-32, (1992)). The cells of this invention either naturally produce a biologically active molecule, or can be genetically engineered to do so. For example, fibroblasts can be transfected with an expression vector for the chosen product (e.g., nerve growth factor, erythropoietin, insulin, CNTF or Factor VIII). Examples of biologically active molecules that may be used to treat diseases or disorders include insulin, which may be used to treat diabetes, parathyroid hormone, which may be used to treat hypoparathyroidism, erythropoietin, which may be used to treat anemia, and gamma-aminobutyric acid to treat epilepsy. Similarly, biologically active molecules such as trophic and growth factors may be used to treat or prevent neurodegenerative conditions such as Huntington's chorea and Alzheimer's disease, AIDS-related dementia, and Parkinson's disease. Biological response factors such as lymphokines or cytokines can enhance a patient's immune system or act as an antiinflammatory agent, and can be useful for treating certain chronic infectious diseases or cancers. Additionally, catecholamines, endorphins, enkephalins, and other opioid peptides may also be supplied by encapsulated cells to treat pain. Encapsulated cells may be used to supply a biologically active molecule useful in correcting an enzymatic deficiency. One example of such a deficiency is fulminant hepatic failure, wherein liver tissue can no longer remove toxins or excrete metabolic waste products. Another example is phenylketonuria, wherein the amino acid phenylalanine builds up to dangerous levels in an affected infant's bloodstream. Alternatively, the encapsulated cells may produce biologically active molecules that remove deleterious or undesirable products from the host. For example, the encapsulated cells may produce biologically active molecules which "scavenge" cholesterol from the host. The biologically active molecules of this invention include hormones, cytokines, growth factors, trophic factors, angiogenesis factors, antibodies, blood coagulation factors, lymphokines, enzymes, and other therapeutic agents or agonists, precursors, active analogs, or active fragments thereof. These include catecholamines, endorphins, enkephalins, and other opioid peptides, dynorphin, insulin, factor VIII, erythropoietin, substance P, nerve growth factor (NGF), glial-cell-line-derived neurotrophic factor (GDNF), platelet-derived growth factor (PDGF), epidermal growth factor (EGF), brain-derived neurotrophic factor (BDNF), neurotrophin-3 (NT-3), neurotrophin-4/5 (NT-4/5) an array of fibroblast growth factors, ciliary neurotrophic factor (CNTF), CNTF-related molecules and insulin-like growth factors I. II and III. In one embodiment, the biologically active molecule is a neurotransmitter. Such neurotransmitters include dopamine, gamma-aminobutyric acid (GABA), serotonin, acetylcholine, norepinephrine, epinephrine, glutamic acid, and other peptide neurotransmitters, preferably dopamine, norepinephrine or epinephrine. In addition, the biologically active molecule may be an agonist, analog, derivative or fragment of a neurotransmitter, including, for example, L-dopa, a dopamine precursor. In another embodiment, the acclimated cells secrete antinociceptive agents including catecholamines, enkephalins, opioid peptides or agonists or analogs thereof, can be used or mixtures thereof. Preferably catecholamines or enkephalins are secreted, most preferably a mixture of catecholamines and enkephalins. The capsules useful in this invention typically have at least one semipermeable outer surface membrane or jacket surrounding a cell-containing core. The jacket permits the diffusion of nutrients, biologically active molecules and other selected products through the capsule. The capsule is biocompatible, and preferably immunoisolatory. The core contains isolated cells, either suspended in a liquid medium or immobilized within a hydrogel matrix. The choice of materials used to construct the capsule is determined by a number of factors and is described in detail in Dionne WO 92/19195. Briefly, various polymers and polymer blends can be used to manufacture the capsule jacket. Polymeric membranes forming the capsule may include polyacrylates (including acrylic copolymers), polyvinylidenes, polyvinyl chloride copclymers, polyurethanes, polystyrenes, polyamides, cellulose acetates, cellulose nitrates, polysulfones, polyphosphazenes, polyacrylonitriles, PAN/PVC, as well as derivatives, copolymers and mixtures thereof. Capsules may be formed by any suitable method known in the art. One such method involves coextrusion of a polymeric casting solution and a coagulant which can include biological tissue fragments, organelles, or suspensions of cells and/or other therapeutic agents. The jacket may have a single skin (Type 1, 2), or a double skin (Type 4). A single-skinned hollow fiber may be produced by quenching only one of the surfaces of the polymer solution as it is cc-extruded. A double-skinned hollow fiber may be produced by quenching both surfaces of the polymer solution as it is co-extruded. Typically, a greater percentage of the surface of Type 1 hollow fibers is occupied by macropores compared to Type 4 hollow fibers. Type 2 hollow fibers are intermediate. See, e.g., Dionne, WO 92/19195 and United States patents 5,158,881, 5,283,187 and 5,284,761, incorporated herein by reference. Numerous capsule configurations, such as cylindrical, disk-shaped or spherical are possible. The jacket of the vehicle will have a pore size that determines the molecular weight cut off (MWCO) of the permselective membrane. Molecules larger than the MWCO are physically prohibited from traversing the membrane. The membrane pore size is chosen to permit the particular factors being produced by the cells to diffuse out of the vehicle, but to exclude the entry of host immune response factors into the vehicle. Typically the MWCO ranges between 50 and 200 kD, preferably between 50 and 100 kD. The most suitable membrane composition will also minimize reactivity between host immune effector molecules known to be present at the selected implantation site, and the vehicle's outer membrane components. The core of the immunoisolatory vehicle is constructed to provide a suitable local environment for the particular cells isolated therein. The core can comprise a liquid medium sufficient to maintain cell growth. Liquid cores are particularly suitable for maintaining transformed cell lines like PC12 cells. Alternatively, the core can comprise a gel matrix. The gel matrix may be composed of hydrogel (alginate, "Vitrogen", etc.) or extracellular matrix components. See, e.g., Dionne WO 92/19195. Compositions that form hydrogels fall into three general classes. The first class carries a net negative charge (e.g., alginate). The second class carries a net positive charge (e.g., collagen and laminin). Examples of commercially available extracellular matrix components include Matrigel™ and Vitrogen™. The third class is net neutral in charge (e.g., highly crosslinked polyethylene oxide, or polyvinylalcohol). Cores made of a hydrogel matrix are particularly suitable for maintaining cells or tissues that tend to form agglomerates or aggregates, such as the cells in islets of Langerhans, or adrenal chromaffin cells. Factors influencing the number of cells or amount of tissue to be loaded within the core of the capsule include (1) capsule size and geometry; (2) mitotic activity of cells within the capsule, and (3) viscosity requirements for core preparation and or loading. These factors are described in detail in Dionne WO 92/19195. Implanted macrocapsules can be readily retrieved using a tether fabricated onto the capsule. Microcapsules can be retrieved using aspiration or any other suitable method. In particular, retrieval of microcapsules is facilitated by use of a pouch device, as described in PCT/US93/0707G. Any suitable method of sealing the capsule may be used, including the employment of polymer adhesives and/or crimping, knotting and heat sealing. These sealing techniques are known in the art. In addition, any suitable "dry" sealing method can also be used. In such methods, a substantially non-porous fitting is provided through which the cell-containing solution is introduced. Subsequent to filling, the capsule is sealed. Such a method is described in PCT/US94/07015, herein incorporated by reference. One or more in vitro assays are preferably used to establish functionality of capsules prior to implantation in vivo. Assays or diagnostic tests well known in the art can be used for these purposes. See, e.g., Methods In Enzymology, Abelson (Ed), Academic Press, 1993. For example, an ELISA (enzyme-linked immunosorbent assay), chromatographic or enzymatic assay, or bioassay specific for the secreted product can be used. If desired, secretory function of an implant can be monitored over time by collecting appropriate samples (e.g., serum) from the recipient and assaying them. If the recipient is a primate, microdialysis may be used. In addition, the metabolic activity of the cells may be followed by monitoring such functions as oxygen uptake, glucose utilization or mitochondrial function. Oxygen uptake rates can be measured using methods known in the art (e.g. using a Diamond General Oxygen Uptake System (#1271) and a Clark-style electrode (#731) with a polyethylene membrane). The genetic stability of cells engineered to express heterologous gene products may be assessed by determining the copy number of the gene insert using techniques known in the art. For example, the plasmid copy number may be measured bv enzymatically digesting genomic DNA, blotting, probing, and comparing the signal to known standards using a PhoshorImager® (Molecular Dynamics). The number of capsules and capsule size should be sufficient to produce a therapeutic effect upon implantation is determined by the amount of biological activity required for the particular application. In the case of secretory cells releasing therapeutic substances, standard dosage considerations and criteria known to the art are used to determine the amount of secretory substance required. Factors to be considered are discussed in Dionne, WO 92/19195. Implantation of the encapsulated cells is performed under sterile conditions. Generally, the capsule is implanted at a site in the host which will allow appropriate delivery of the secreted product or function to the host and of nutrients to the implanted cells or tissue, and will also allow access to the capsule for retrieval and/or replacement. The invention will now be further illustrated by the following examples, which are not to be viawed as limiting in any way. A BHK cell line secreting NGF was produced and exposed to a low oxygen and glucose environment. A 2.51 kb fragment containing approximately 37 bp of the 3' end of the first intron, the double ATG sequence believed to be the protein translation start for pre-pro-NGF and the complete coding sequence and entire 3' untranslated region of the human gene (Hoyle et al., Neuron, 10, pp. 1019-34, 1993) was subcloned into the DHFR-based pNUT expression vector immediately downstream from the mouse metallothionein-1 promotor (-650 to +7) and the first intron of the rat insulin II gene (Baetge et al., Proc. Natl. Acad. Sci., 83, pp. 5454-58 (1986). Permselective hollow fibers were prepared via a dry jet-wet spinning technique [Cabasso, Hollow Fiber Membranes, vol. 12, Kirk-Othmer Encyclopedia of Chemical Technology, Wiley, New York, 3rd Ed., pp. 492-517, 1980; Dionne, WO 92/19195]. Asymmetric hollow fibers were cast from solutions of 10% polyacrylonitrile polyvinyl chloride (PAN/PVC) copolymer in dimethyl sulfoxide (w/w) and quenched directly into a coagulant bath. The resulting double skinned (Type 4) fibers were collected into a nonsolvent water bath, glycerinated, and dried. Eight ml of rat tail colJagen (Type IV, Collaborative, lot 91-1083) were added to 1 ml of phenol red/phosphate buffered saline (PBS) and the solution adjusted to pH 7.0. Eight ml of Vitrogen® (Celtrix, Palo Alto, CA; Lot 92H176) were added to 2 ml of phenol red/PBS. Equal volumes of the collagen and Vitrogen® solutions were mixed together to form the matrix solution. Single cell suspensions of NGF-producing BHK cells grown to 90% confluency were rinsed with PBS (lacking calcium and magnesium), trypsinized for approximately 1 minute and pelleted by centrifugation at 1000 rpm for 3 minutes. The cells were resuspended in medium to a final cell concentration of 2x107 cells/ml. This cell suspension was then mixed.1:1 with collagen/Vitrogen® matrix solution, bringing the final cell concentration to 1x107 cells/ml. Cells were gently mixed in matrix to assure even distribution of the slurry prior to encapsulation. 2.5 microliters (ul) of the cell/matrix slurry (10,000 cells/ul) were loaded into a fiber using a 24-gauge beveled catheter tip and a Hamilton syringe. Capsules were sealed by mounting a 1 - 1.1 cm length of dry hollow fiber onto a hub with a septal fixture at the proximal end which has loading access for cells to be injected into the lumen of the device. After infusing 2.5 µl of the cellular suspension, the septum was cracked off and the access port sealed using a light-cured acrylate (Luxtrak™ LCM 24, ICI Resins US, Wilmington, MA) ("hub" sealed). The capsules were subsequently "tiethered" by placing a 1.5 cm 0.020" silastic tube over the acrylic hub. Capsules were acclimated for three days at ambient oxygen levels, and tested for baseline NGF secretion. Three-day old medium was replaced with 1 milliliter (ml) of fresh medium. Capsules were then placed in a 24-well plate containing low glucose (0.8 mg/l) and low oxygen (50 mmHg) or high glucose (5.5 mg/l) and ambient (142 mmHg) oxygen levels. Media were changed and NGF assays performed every 7 days. One day prior to a change, fresh media were brought to the appropriate oxygen concentrations for each acclimation condition. Encapsulated cells were cultured in this way for four weeks. NGF levels were determined by ELISA (enzyme-linked immunosorbent assay) on days 0, 3, 7, 14, 21, and 28. Representative capsules were fixed with 4% paraformaldehyde for histological determination of cell viability profiles. Following fixation in 4% paraformaldehyde, the retrieved capsules were rinsed with phosphate buffered saline (PBS), dehydrated in graded alcohol up to 95% and embedded in glycol methacrylace infiltration solution (Historesine Mounting Medium, Reichert-Jung). Three micron thick sections were cut on a microtome (Supercut 2065, Leica), mounted on glass slides and stained with cresyl violet. The quantification of hNGF released from encapsulated BHK/NGF cells was performed as follows. Nunc-Immuno Maxisorp ELISA plates were coated with 150 µl per well of anti-mouse-β (2.5S) NGF at 1 ng/ml in coating buffer (1xPBS without CaCl2 and without MgCl2/0.1% sodium azide; pH 9.6) and incubated at 37°C for at least 2 hours or alternatively at 4°C overnight. The coating solution was discarded, the wells were washed 3 x with 300 µl wash buffer (50 mm Tris-HCl/200 mm NaCl/1% Triton X-100/0.1% sodium azide; pH 7.0) and blocked with 300 µl of coating solution containing 10 mg/ml of BSA at room temperature for 30 min. The wells were then washed 3 x with 300 µl wash buffer. Conditioned medium samples were diluted 1:1 in 2x sample buffer (the sample buffer is the same as wash buffer, only with 2% BSA), with 10 µl of the prepared samples loaded into the wells. The plates were incubated for at least 2 hours at 37°C or overnight at 4°C. Each well was emptied, washed 3 X with 300 µl of wash buffer and 100 µl of 4U/ml of anti-mouse-β (2.55) NGF-β-gal conjugate was added. The plates were incubated at 37°C for at lease 1 hour. Each well was emptied, washed 3 X with 300 of wash buffer, and 200 µl of chlorophenol red-β-D-galactopyranoside substrate solution (40 mg CPRG in 100 mm Hepes/150 mm NaCl/2 mm MgCl2/0.1% sodium azide/1% BSA; pH 7.0) added. The plates were incubated at 37°C for 30 min to one hr or until color development was sufficient for photometric determination at 570 nm. The NGF release per capsule as a function of time under the two environmental conditions is shown for the 10% Type 4 fiber with hub seals in Figures 1 and 2. Data is expressed as ng NGF released per capsule per 24 hours. Production of NGF per capsule increased over the evaluation period. BHK-hNGF cells were loaded into the three types of macrocapsule, and sealed as described in Example 1. The capsules were exposed to low glucose and low oxygen conditions for four weeks and tested for NGF release as described in Example 1. The NGF output from the three different capsule types as a function of time is shown in Figure 3. The average NGF release from the 10% PAN/PVC capsule was about 50ng/capsule/24hr after 4 weeks, compared to about 30ng/capsule/24 hours for the 12.5% PAN/PVC capsule. The 15% PAN/PVC capsule produced no detectable levels of NGF after 1, 2, 3 or 4 weeks. Histological examination of the capsules confirmed that healthy cell clusters were present in 10% and 12.5% PAN/PVC capsules. Only dead cells were present in 15% PAN/PVC capsules after 4 weeks. EXAMPLE 3: Encapsulated BHK-hNGF cells are implanted into a host. The encapsulated cells of Example 1 are exposed to the low oxygen and glucose concentrations of Example 1 until the level of NGF secretion from the BHK cells is stable under these restrictive conditions. The encapsulated cells are implanted into a human host. Implantation sites include the lateral ventricles and striatum of the brain. Procedures for implantation of capsules into the brain are published in Aebischer et al., WO 93/00127, incorporated herein by reference. EXAMPLE 4: Encapsulated adrenal chromaffin cells exposed to in vitro restrictive conditions. Bovine adrenal chromaffin cells were recovered from adrenal glands by collagenase digestion as described in Livett, Physiol. Rev., 64, pp. 1103-62 (1984). Adrenal cell aggregates were immobilized in a 1.5% alginate matrix crosslinked with CaCl2 and encapsulated in double skinned Type 4, immunoisolatory PAN/PVC hollow fiber membranes (ID 750 µm, wall 85 µm, MWCO 60 kD), substantially as described in WO92/19195. The encapsulated cells were cultured for 2 weeks at pO2 of 20, 40, 60, 80, and 142 mmHg. The cells were tested for basal and K+-evoked catecholamine release on day 2 and 14. After 14 days, the capsules were fixed in 4% paraformaldehyde and processed for histology, sectioned, and assessed morphologically. Catecholamines were analyzed by HPLC using electrochemical detection. The chromatographic system used a coulometric multielectrode detector (model 5100A, ESA, Inc.), a Hitachi L6200 pump (Hitachi, Inc.), and a Hypersil 150 mm X 4.6 mm, 3 micron ODS column (Keystone Scientific Inc.) fitted with an MPLC NewGuard Column (Applied Biosystems, Inc.). Runs were performed at 26°C. The mobile phase consisted of 75 mM NaH2PO4, 1.4 mM octanesulfonic acid, 0.274 mM EDTA and 100 mL/L CH3CN. 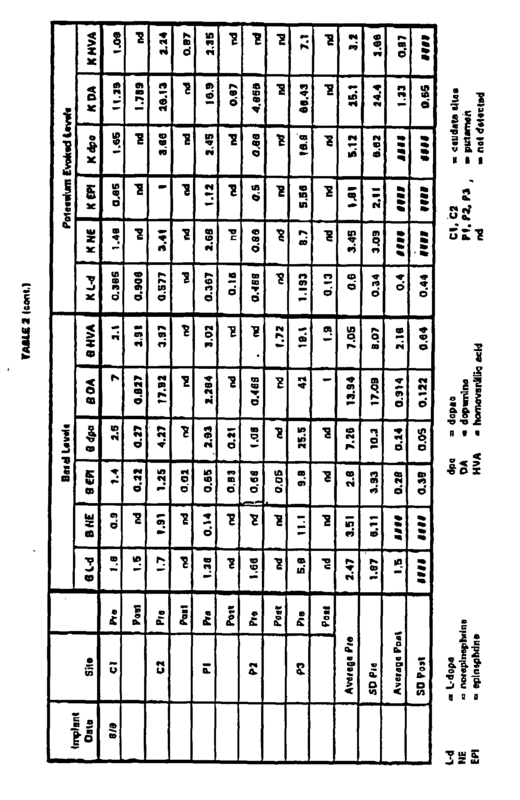 The pH was adjusted to 3.0 using concentrated phosphoric acid. The flow rate was maintained at 1.0 mL/min. The detector was equipped with a preinjector guard cell (model 5020) operating at +450mV and a high resolution dual analytical cell (model 5011) operating in an oxidative screen mode at -40mV and +400mV for electrode 1 and 2, respectively. Analytes were measured at detector 2. Triplicate standards were used to validate detection thresholds of 52 fmol for L-Dopa (L-3,4-Dihydroxyphenylalamine), Dopac (3,4-Dihydroxyphenylacetic acid), norepinephrine (NE) and dopamine (DA), and of 104 fmol on-column for HVA (Homovanillic acid) with percent standard deviation ranges at threshold of 2-5%, 9-12%, 15-24% and 6-17%, respectively. Singlicate 7-point standard curves were linear across an on-column analyte range of 52 to 3300 fmol for L-Dopa, Dopac, NE and DA, and 104 to 6600 fmoles for HVA, with r2 values of 0.999, 0.998, 0.999, and 0.999, respectively. Data were captured and peak areas integrated using a Waters 845 VAX Chromatography Workstation. The results are shown in Figure 4. Data is expressed as picomoles per 30 minutes (basal output) or picomoles per 15 minutes (K+-evoked output). At higher O2 concentrations, the basal, and more particularly the K+-evoked, release of both norepinephrine (NE) and epinephrine (EPI) was higher at day 14 than at day 2. Thus, exposure of encapsulated cells to restrictive conditions resulted in alteration of one or more cell properties. EXAMPLE 5: Encapsulated adrenal chromaffin cells exposed to in-vivo restrictive conditions. Bovine adrenal chromaffin cells were prepared as described in Example 4. Adrenal cell aggregates were immobilized in a 1.5% alginate matrix crosslinked with CaCl2 and encapsulated in either single skinned Type 2, immunoisolatory PAN/PVC hollow fiber membranes (ID 500 µm, wall 70-90 µm, MWCO 60 kD), or double skinned Type 4 immunoisolatory PAN/PVC hollow fiber membranes (ID 500 µm, wall 70-90 µm, MWCO 60 kD), substantially as described in WO92/19195. The encapsulated cells were exposed to in vivo restrictive conditions by implantation into the striatum in rat recipients. Two capsules were implanted per rat, bilaterally. Following midline incision, a hole was drilled in the skull at coordinates +0.5 mm to bregma, 3.0 mm lateral with the incisor bar set -0.3 mm below the intra-aural line. The capsules were lowered 7 mm deep to the dura. Capsules were assayed for catecholamine production before implantation and after a 6 week period in vivo. Catecholamines were assayed as described in Example 4. Figure 5 shows the results obtained using Type 2 membranes. Data is expressed as picomoles per capsule per 15 minutes. The levels of basal (Panel A) and K+-evoked (Panel C) NE and EPI release were similar before and after the 6 week implantation period. However, the level of nicotine-evoked (Panel B) NE and EPI release after the 6 week in vivo exposure period was higher than the pre-implantation level. Figure 6 shows the results obtained using Type 4 membranes. The levels of K+-evoked (Panel C) NE and EPI release were similar before and after the 6 week implantation period. However, the level of nicotine-evoked (Panel B) NE and EPI release after the 6 week in vivo exposure period was higher than the pre-implantation level. In addition, there were differences between the basal level of catecholamine release before and after the 6 week implantation period (Panel A). EXAMPLE 6: Encapsulated adrenal chromaffin cells exposed to in vivo restrictive conditions. Bovine adrenal chromaffin cells were prepared as described in Example 4. Adrenal cell aggregates were immobilized in a 1.5% alginate matrix crosslinked with CaCl2 and encapsulated in double skinned Type 4, immunoisolatory PAN/PVC hollow fiber membranes (ID 500 µm, wall 70-90 µm, MWCO 60 kD), substantially as described in WO92/19195. The encapsulated cells were exposed to in vivo restrictive conditions by implantation into the spinal subarachnoid space in rat recipients. Surgical procedures were performed substantially as described in Aebischer et al., WO 93/00127. Capsules were assayed for catecholamine production before implantation and after a 6 week period in vivo. Catecholamines were assayed as described in Example 4. Data is expressed as picomoles per capsule per 30 minutes. Figure 7 shows the difference in pre- and post-implantation levels of NE and EPI production. The encapsulated cells were implanted for a period of 6 months. After 6 months in vivo, basal and nicotine-stimulated, EPI production was significantly decreased, while NE production was significantly increased. EXAMPLE 7: Encapsulated PC12 cells exposed to in vivo restrictive conditions in primate brain. PC12 cells were grown in suspension culture in RPMI supplemented with 10% heat inactivated horse serum, 5% fetal calf serum and 100 units penicillin/streptomycin, harvested, centrifuged and the supernatant discarded. Fluka High MW chitosan (4.4 g) was dissolved in 150 ml of sterile 0.85% saline at 70°C, using vigorous stirring. The pH of the solution was adjusted to 6.2 using 45 ml of 100 mM HEPES buffered saline (pH 8.0). The solution was sterile filtered through a 0.22 µm millipore filter. The chitosan solution was mixed with an equal volume of RFMI and used to resuspend the cell pellet to a concentration of 5 X 206 cells/ml. The cells/chitosan solution (approx. 1,000 µl) was coextruded with PAN/PVC, to form single skinned, XP11 immunoisolatory PAN/PVC hollow fiber membranes (ID 450-500 µm, wall 50-65 µm, MWCO 65-100 kD, hydraulic permeability 53 ml/min/m2/mmHg, glucose mass transfer coefficient 8 X 10-4 cm/s, pore size permeability 88% BSA rejection coefficient). These fibers were formed using the general procedure described in United states patent Nos. 5,158,881, 5,283,187 and 5,284,761. Fibers were trimmed to appropriate dimensions (approx. 1 cm) and sealed by heat crimping the ends. Encapsulated cells were implanted in three cynomologous monkeys. Surgical procedures were performed substantially as described in Aebischer et al., WO 93/00127. Two capsules were implanted at different positions in the caudate and three capsules implanted at different locations in the putamen. The nominal stereotaxic coordinates for implantation into the putamen and caudate were derived as follows: putamen site 1 = 23.0 mm anterior from intra-aural zero, 9.0 mm lateral from the sagittal suture and 16.5 mm ventral from the surface of the brain; putamen site 2 = 19.0 mm anterior from intra-aural zero, 10.0 mm lateral from the sagittal suture and 19.5 mm ventral from the surface of the brain; putamen site 3 = 15.5 mm anterior from intra-aural zero, 11.5 mm lateral from the sagittal suture and 21.0 mm ventral from the surface of the brain; caudate site 1 = 18.0 mm anterior from intra-aural zero, 4.0 mm lateral from the sagittal suture and 15.0 mm ventral from the surface of the brain; caudate site 2 = 22.0 mm anterior from intra-aural zero, 4.5 mm lateral from the sagittal suture and 18.0 mm ventral from the surface of the brain. The encapsulated cells were implanted for approximately 6 months, and then retrieved. The capsules were assayed for pre and post-implant basal and K+-evoked levels of L-dopa (L-d), norepinephrine (NE), epinephrine (EPI), dopac (dpc), dopamine (DA), and homovanillic acid (HvA), as described in Example 4. The data shown in Table 2 are expressed as picomoles per capsule per 30 minutes (basal) or picomoles per capsule per 15 minutes (K+-evoked). As the results in Table 2 show, the properties of the encapsulated cells are significantly different after the 6 month exposure to the restrictive conditions. EXAMPLE 8: Encapsulated PC12 cells are implanted into a human. PC12 cells are encapsulated and implanted in a recipient as described in Example 7. After 6 months, the capsules are explanted and assayed for the L-dopa to dopamine ratio. The cells are plated in multiwell dishes, and cultured under a range of O2 conditions in vitro. The cells are assayed periodically for L-dopa and dopamine output. Cells which release the target L-dopa to dopamine ratio are selected and implanted into human brain, using surgical procedures substantially as described in WO 92/00127. Capsules were prepared from hollow fibers with a phase inversion technique using PAN/PVC hollow fibers substantially as described in Example 7 (ID 450-500 µm, wall 50-65 µm, MWCO 100 kD, hydraulic permeability 53 ml/min/m2/mmHg). PC12 and PC12A cells were cultivated in 500 ml spinner cultures at 80 RPM in a serum-free defined medium HL-1 (Ventrex, Inc., Portland, Maine) at 37°C in a water-saturated, 7% CO2 ambient air atmosphere. Cells were harvested by collecting spinner culture supernatant and centrifuging at 800 g. Viability was assessed by exclusion of trypan blue and shown to be 90±5% prior to encapsulation. The cells were resuspended in HL-1, pH 7.3, at a concentration of 4 x 107 cells/ml. An equal volume of a solution containing 2% (w/v) of pH 6.7 low viscosity chitosan (PROTOSAN®, chitosan chloride, Protan Biopolymer, Drammen, Norway), was added to the PC12 and PC12A cells resulting in a final cell concentration of 2.0 x 107 cells/ml. Individual capsules were 7±0.5 mm in length. PC12 and FC12A cell-loaded capsules were fabricated in two separate batches and placed in a 24 multiwell tissue culture plate containing 1 ml of HL-1 medium. Rats were anesthetized with a 1.0 ml/kg intramuscular injection of a mixture of ketamine (33 mg/ml), xylazine (1.7 mg/ml), and acepromazine (10 mg/ml) and positioned in a Kopf stereotaxic instrument. A total of 12 µg of 6-OHDA (6 µl volume at a concentration of 2 µg/µl dissolved in 0.9% saline containing 0.2 µg/µl ascorbic acid) were infused at a rate of 1.0 µl/minute and allowed to diffuse for 5 minutes before the infusion cannula was slowly retracted. Infusion coordinates were 4.2 mm posterior to bregma, 1.0 mm lateral from midline, and 7.4 mm ventral to dura. Four months after being lesioned (2.75 months after the last apomorphine injection), capsules were implanted. Rats were anesthetized as before, and a sagittal incision was made in the scalp and a hole drilled for placement of the polymer capsule. Rats were implanted by placing the capsule within an 18-gauge Teflon catheter mounted to the stereotaxic frame. A stainless steel obturator was placed within the cannula, the device lowered into the brain, and the obturator held in place while the outer cannula was raised to passively place the capsule within the host striatum. The stereotaxic coordinates for implantation were: 0.5 mm anterior to bregma, 3.8 mm lateral to the sagittal suture, and 7.5 mm below the surface of the cortex. Rats not receiving implants were given sham surgeries (anesthetized, scalp lacerated, skull drilled, and dura punctured). After the completion of behavioral testing, rats with no capsules, FC12, PC12A, and half the rats with the empty capsules were anesthetized in a CO2 chamber and quickly decapitated. Their brains were removed from the skulls, the capsules were removed, both striata were dissected out, placed in Eppendorf tubes, and quick-frozen in liquid nitrogen. Following capsule retrieval from the host striatum, capsules were placed in 1 ml of phosphate HBSS for approximately 30 min. The phosphate HBSS was removed, and 1 ml of HEPES HBSS was added. Catecholamine analyses were performed as described in Example 4. After the catecholamine assay was completed the devices were placed in 4% paraformaldehyde and submitted for morphologic analyses. Figure 8 shows release of dopamine and L-dopa measured over a 30 minute period plotted for individual capsules, each assigned an identifier number. As shown in Figure 8, the 90 day post-implant production levels of L-dopa and dopamine were significantly different than the pre-implant levels. EXAMPLE 10: Encapsulated adrenal chromaffin cells exposed to in vivo restrictive conditions in the human subarachnoid space. Bovine adrenal chromaffin cells were prepared as described in Example 4. Adrenal cell aggregates were immobilized in a 1.5% alginate matrix crosslinked with CaCl2 and encapsulated in double skinned Type 4, immunoisolatory PAN/PVC hollow fiber membranes (ID 770 µm, wall 70 µm, HMCO 60-100 kD), substantially as described in WO92/19195. The encapsulated cells were implanted in the subarachnoid space in two human patients, with terminal cancer, pain incompletely relieved by narcotic therapy, and no evidence of active infection or tumor in the meningeal space. Informed consent was granted by the patients and approval was received from the Ethical committee of the Faculty of Medicine of the University of Lausanne, Switzerland. Local infiltration with 1.0% lidocaine was used to establish anesthesia of the skin as well as the periosteum and other deep connective tissue structures down to and including the ligamentum flavum. A 3-5 cm skin incision was made in the parasagittal plane 1-2 cm to the right or left of the midline and was continued down to the lumbodorsal fascia. Using traditional bony landmarks including the iliac crests and the lumbar spinous processes, as well as fluoroscopic guidance, an 18 gauge Touhy needle was introduced into the subarachnoid space between L-3 and L-4 via an oblique paramedian approach. The needle was directed so that it entered the space at a shallow, superiorly directed angle that was no greater than 30-35° with respect to the spinal cord in either the sagittal or transverse plane. A guide wire was passed down the lumen of the Touhy needle hub until it extended 4-5 cm into the subarachnoid space (determined by promeasuring). The Touhy needle was removed from the wire. A 7 French dilator was then placed over the guide wire and the wire was used to direct the dilator as it was gently but firmly pushed through the fascia, paraspinous muscle, and ligamentum flavum, following the track of the wire toward the subarachnoid space. After the wire track was "overdilated" by the 7 French dilator, a 6 French dilator and cannula sheath were assembled and placed over the guide wire. The 6 French dilator and cannula were advanced carefully into the subarachnoid space until the opening tip of the cannula was positioned 7 cm within the space. When appropriate positioning of the cannula was assured, the guide wire and the 6 French dilator were gently removed from the lumen of the cannula in sequence. The encapsulated adrenal chromaffin cell was provided in a sterile, double envelope container, bathed in transport medium, and fully assembled including a tubular silicone tether. The membrane portion of the device was carefully introduced into the cannula. The capsule was advanced until the tip of the membrane reached a point that was 2-10 mm within the cranial tip of the cannula in the subarachnoid space. After the capsule was positioned using a pusher, the cannula and pusher were completely withdrawn. The final placement of the capsule was such that the 5 cm long membrane portion of the device lay entirely within the CSF containing subarachnoid space ventral to the cauda equina. EXAMPLE 11: Acclimated and re-encapsulated BHK-hNGF cells exposed to in vivo restrictive conditions. Encapsulated BHK-hNGF cells were prepared according to Example 1, implanted in the lateral ventricle of rat brain and acclimated by exposure to in vivo restrictive conditions for 14 months. After 14 months, the capsules were explanted and the acclimated cells from two capsules pooled and expanded by passage in 10% FES DMEM medium. A clonal line, designated BHK-hNGF clone 23, was used for this experiment. These cells were aliquoted and portions were frozen in liquid nitrogen. Control BHK-hNGF clone 23 cells, not acclimated in vivo, were grown in vitro in 10% FBS DMEM (BHK-hNGF clone 23 cell bank). Group 5: BHK-control cells (from bank; not previously implanted); encapsulated in Vitrogen® matrix; capsules implanted in lateral ventricles of rat brain; and Group 6: BHK-control cells (from bank; not previously implanted); resuspended in 10% FBS DMEM (no matrix) for encapsulation; capsules implanted in lateral ventricles of rat brain. Acclimated BHK-hNGF clone 23 cells were encapsulated essentially as described in Example 1. Most capsules were made from HF120794-6 fibers and had a final length of 7 mm. Several control capsules were made from 101-97-9 fibers which are comparable to the XP11 fibers used in Examples 7-9. HF120794-6 single skinned fibers have, on average, a wall thickness of 86.4µ; an inner diameter (I.D.) of 453.2µ; an outer diameter (O.D.) of 625.1µ; a hydraulic permeability (HP) of 43.0 mm/min/m2/mmHg; and a molecular weight cut off (MWCO) based on a dextran diffusion test of 187 kD. The 101-97-9 single skinned fibers have, on average, a wall thickness of 59µ; an I.D. of 541µ; a tensile strength of 31g; a HP of 62 mm/min/m2/mmHg; and a MWCO based on a dextran diffusion test of 88 kD. Cells encapsulated in matrix (Groups 1, 3 and 5) were resuspended in Vitrogen® diluted 1:1 with PC-1 medium at a loading density of 1x107 cells/ml. Capsules were held in PC-1 medium for a period of 5-7 days pre-implantation. The cells of groups 2, 4 and 6 encapsulated without matrix were resuspended in 10% FBS DMEM and placed in tubes on a rollerdrum for the pre-implantation holding period. Capsules containing BHK-hNGF cells previously acclimated in vivo and control capsules were randomly chosen and implanted bilaterally in the lateral ventricle of rats. Parallel samples of non-acclimated BHK-bNGF cells served as controls. Capsules from Groups 1-6 were assayed for NGF release as described in Example 1. NGF release from capsules containing acclimated or non-acclimated cells was measured before implantation and after implantation for a one month period. The NGF output from capsules of Groups 1-4 is shown in Figure 11. The data for non-NGF producing control cells is not shown. After NGF output assays, capsules were fixed in 4% paraformaldehyde and processed for histology, sectioning and morphological analyses. PC12 cells were cultured and encapsulated substantially as described in Example 9. 6-hydroxydopamine (6-OHDA) is selectively toxic to dopaminergic neurons in the substantia nigra. Rats given a 6-OHDA lesion in the substantia nigra develop Parkinson's disease-like characteristics associated with low dopamine levels. Rats were anesthetized as described in Example 9 and positioned in a Kopf stereotaxic instrument. A total of 10 µg of 6-OHDA (4 µg volume at 2.5 µg/µl dissolved in 0.9% saline containing 0.2 µg/µl ascorbic acid) were infused unilaterally and allowed to diffuse for 5 minutes before the infusion cannula was slowly retracted. Infusion coordinates were 3.2 mm posterior to bregma, 2.7 mm lateral from midline, and 8.0 mm ventral to dura with the incisor bar sat at +5.0 mm. Capsules were implanted bilaterally three to four weeks after rate were unilaterally lesioned. Rats ware anesthetized and capsules implanted using the procedures and stereotaxic coordinates described in Example 9. Devices were removed at 3, 10, 28, and 60 days post-implantation. Rats were anesthetized in a CO2 chamber and quickly decapitated. The brains were removed from the skulls and capsules were removed from lesioned and non-lesioned (control) sides of the brain. Both striata and nuclei accumbens were dissected out for catecholamine analysis by placing them in Eppendorf tubes and quick-freezing the tubes in liquid nitrogen. Capsules were placed in 1 ml phosphate HBSS for approx. 30 min. The phosphate HBSS was removed, and 1 ml HEPES HBSS added. Catecholamine analyses were performed as described in Example 4. After catecholamine assays were completed the capsules were placed in 4% paraformaldehyde for morphological analyses. Figure 9 (Panel A) shows the average release of L-dopa over a 30 min. period from 8 capsules pre-implantation ("Pre-"), and from capsules explanted at 5, 14, 28 or 60 days post-implantation from either lesioned (low dopamine) or non-lesioned (control) striata. Panel A shows that the relative amounts of catecholamine produced by encapsulated PC12 cells changes over time. Capsules explanted from both lesioned and control sides showed higher L-dopa output rates after acclimation in vivo for between two and three weeks. Figure 9 (Panel B) shows the ratio of L-dopa to dopamine released from the capsules of Panel A described above. Panel B shows that after acclimation in vivo in a low dopamine environment, encapsulated cells produced a lower L-dopa to dopamine ratio than the cells acclimated in a control environment. The L-dcpa to dopamine ratios became relatively stable after about 14 days in vivo. Capsules explanted from both the lesioned and control sides showed higher output L-dopa to dopamine ratios after being acclimated in vivo compared to the pre-implant output levels. EXAMPLE 13: Comparison of Pre- and Post-Implant Catecholamine Output Values from Encapsulated PC12 Cells Acclimated in Primate Brain. catecholamine output values from a number of studies in which PC12 cells -- encapsulated in "XP11-equivalent" fibers and acclimated in primate brain as described in Example 7 -- are compared to the catecholamine output values from the same capsules before they were implanted. Encapsulated PC12 cells were assayed for basal L-dopa and dopamine output rates before implantation. 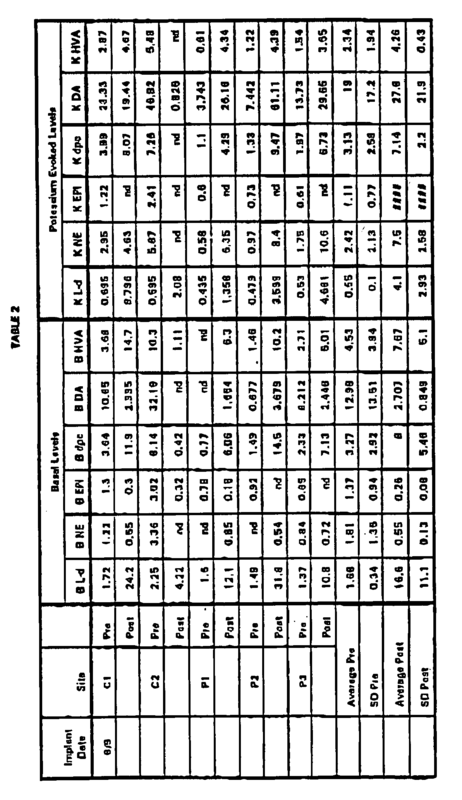 The data reported in Table 4 represents the pre-implant catecholamine output. Capsules were then implanted into primate brains for in vivo acclimation, explanted at 1, 2.5, 3, 4, 5 and 6 months after implantation and assayed for basal L-dopa and dopamine output rates (Figure 10). The human CNTF (hCNTF) gene was inserted into a dihydrofolate reductase (DHFR) based expression vector designated pNUT, which contains the entire pUC 18 sequence including the polylinker. The transcription of the cDNA encoding the mutant form of DHFR is driven by the SV40 promoter. The 3' end is fused with the 3' end of the hepatitis B virus gene (HBV 3') to ensure efficient polyadenylation and maturation signals. The hCNTF gene was obtained by PCR amplification of human DNA. The primers used contained EcoRI site at the position of the natural hCNTF initiation codon. The hCNTF gene was fused at its 5' extremity to a 150 bp sequence from a mouse immunoglobulin (Ig) gene. The EcoRI site was used in such a way that the amino terminal part of the hCNTF protein corresponds to the first 18 amino acids of the Ig gene. A 325 bp AvaI fragment from the human growth hormone gene (hGH) containing the polyadenylation sequence and other sequences important for mRNA 3' end maturation was cloned at the 3' extremity of the hCNTF gene. Briefly, this fragment was introduced in the SpeI site of a Bluescript polylinker creating a BamHI and NotI site at the 5' and 3' ends, respectively. The BamHI site was ligated to the BglII site engineered at the 3' end of hCNTF. This construction was inserted at position +6 of the mouse MT-I promoter and the entire 3050 bp MT/Ig/hCNTF/hGH KpnI-NotI fragment was inserted into the KpnI-NotI site of the pNUT vector. Finally, the HSV-TK gene was cloned in the NotI site of the vector, thus separating it from the DHFR gene by the entire pUC-18 plasmid. This final construction is named RP3224E2. The RP3224E2 vector DNA was amplified in a standard E. coli strain (HB101) and purified using a Qiagen-Plasmid Kit (Kontron). DNA was transfected using a standard calcium/phosphate transfection procedure and selected with increasing concentrations of methotrexate. Cells are selected continuously in methotrexate while being maintained in PC-1 tissue culture medium. The PC-1 medium is a defined medium containing protein from human recombinant sources. Following drug selection (25 to 200 µm methrotrexate), the BHK cells (BHK-CNTF) were maintained in vitro without drug selection for several months and showed no loss of CNTF expression as assessed by Northern blot analysis, bioassays or ELISA. The level of CNTF production was about 1.0 ng/103 cells/hour as determined by bioassay and by ELISA. The CNTF-secreting BHK cells (BHK-CNTF) of Example 14 were encapsulated essentially as described in Example 1, except that a longer tether appropriate in length for implantation into human lumbar subarachnoid space was used. Devices were loaded at a density of 2x105 transfected cells/µl of collagen solution (Zyderm). The CNTF released from each capsule was measured by immersing the capsule in 2 ml of fresh PC1 medium for 30 min. CNTF determination was then performed on the collected medium using the R&D Elisa system. The capsules were chosen to deliver a dosage of CNTF of 1µ/day intrathecally. Each human patient received one device. The encapsulated BHK-CNTF cells have been implanted for 1 month into the lumbar subarachnoid space of a human subject. Additional capsules will be acclimated in vivo for up to 6 months. Upon explant at one month, the rate of CNTF release per capsule was assayed as described in Example 12. After CNTF assays were performed, capsules were fixed in 4% paraformaldehyde for morphological analyses. The BHK-CNTF cells acclimated in vivo were removed from the capsules, pooled, and immediately cultured by growing in PC1 medium under low oxygen and glucose restrictive conditions selected to most closely match the environment of the subarachnoid space of the subject. BHK-CNTF cells were cultured under ambient conditions as parallel controls. The acclimated cells will be characterized, and can be further acclimated to other restrictive conditions. In one set of experiments, in vivo acclimated BHK-CNTF cells, cultured in vitro under ambient or restrictive conditions, will be re-encapsulated (following essentially the same procedures used for the first encapsulation) and implanted into a host subject. In another set of experiments, the acclimated cells implanted into the human host will first be acclimated to in vitro restrictive conditions in a non-human primate recipient. Subjects will be patients diagnosed with ALS as manifested by a combination of both upper motor neuron and lower motor neuron deficits at multiple levels; confirmatory electrophysiologic studies demonstrating active and chronic denervation in 3 limbs or 2 limbs and bulbar musculature; no neurological involvement outside the voluntary motor system; no evidence of primary disease that could cause neurologic deficit, particularly cervical spondylosis of plasma cell dyscrasia. The patient is relatively strong, i.e. can walk unassisted and is early in the course of the disease. The patent has forced vital capacity >75% of normal at the time of entry. The patients are monitored every day during the first week, once a week from the second to the fourth week and once a month thereafter, for, inter alia, side effects such as fever, stomatitis, cough and the reactivation to herpes. The following tests are performed once a month for efficacy evaluation: Tufts Quantitative Neurological Exam (TQNE); Bulbar coordination; Respiratory function--forced vital capacity, inspiratory flow. Blood is drawn once a week for the first four week and once a month thereafter for detection of plasma CNTF, potential antibodies to CNTF, C-reactive protein, fibrinogen. The surgical procedure for implantation of the encapsulated BHK-CNTF cells is as follows. After establishing IV access and administering prophylactic antibiotics (cefazolin sodium, 1 gram IV), the patient is positioned on the operating table, generally in either the lateral decubitus or genu-pectoral position, with the lumbar spine flexed anteriorly. The operative field is steriley prepared and draped exposing the midline dorsal lumbar region from the levels of S-1 to L-1 and allowing for intraoperative imaging of the lumbar spine with C-arm fluoroscopy. Local infiltration with 1.0% lidocaine is used to establish anesthesia of the skin as well as the periosteum and other deep connective tissue structures down to and including the ligamentum flavum. A 3-5 cm skin incision is made in the parasagittal plane 1-2 cm to the right or left of the midline and was continued down to the lumbodorsal fascia using electrocautery for hemostasis. Using traditional bony landmarks including the iliac crests and the lumbar spinous processes, as well as fluoroscopic guidance, an is gauge Touhy needle is introduced into the subarachnoid space between L-3 and L-4 via an oblique paramedian approach. The needle is directed so that it enters the space at a shallow, superiorly directed angle that is no greater than 30-35° with respect to the spinal cord in either the sagittal or transverse plane. Appropriate position of the tip of the needle is confirmed by withdrawal of several ml of cerebrospinal fluid (CSF) for preimplantation catecholamine, enkephalin, glucose, human CNTF, and protein levels and cell counts. The Touhy needle hub is reexamined to confirm that the opening at the tip is oriented superiorly (opening direction is marked by the indexing notch for the obturator on the needle hub), and the guide wire is passed down the lumen of the needle until it extends 4-5 cm into the subarachnoid space (determined by premeasuring). Care should be taken during passage of the wire that there is not resistance to advancement of the wire out of the needle and that the patient does not complain of significant neurogenic symptoms, either of which observations might indicate misdirection of the guide wire and possible impending nerve root or spinal cord injury. After the guide wire appears to be appropriately placed in the subarachnoid space, the Touhy needle is separately withdrawn and removed from the wire. The position of the wire in the midline of the spinal canal, anterior to the expected location of the cauda equina, and without kinks or unexplainable bends is then confirmed with fluoroscopy. After removal of the Touhy needle the guide wire should be able to be moved freely into and out of the space with only very slight resistance due to the rough surface of the wire running through the dense and fibrous ligamentum flavum. The 7 French dilator is then placed over the guide wire and the wire is used to direct the dilator as it is gently but firmly pushed through the fascia, paraspinous muscle, and ligamentum flavum, following the track of the wire toward the subarachnoid space. Advancement of the 7 French dilator is stopped and the dilator removed from the wire as soon as a loss of resistance is detected after passing the ligamentum flavum. This is done in order to avoid advancing and manipulating this relatively rigid dilator within the subarachnoid space to any significant degree. After the wire track is "overdilated" by the 7 French dilator, the 6 French dilator and cannula sheath are assembled and placed over the guide wire. The 6 French dilator and cannula are advanced carefully into the subarachnoid space until the opening tip of the cannula is positioned 7 cm within the space. As with the 7 French dilator, the assembled 6 French dilator and cannula are directed by the wire within the lumen of the dilator. Position within the subarachnoid space is determined by premeasuring the device and is grossly confirmed by fluoroscopy. Great care should be taken with manipulation of the dilators and cannula within the subarachnoid space to avoid misdirection and possible neurologic injury. When appropriate positioning of the cannula is assured, the guide wire and the 6 French dilator are gently removed from the lumen of the cannula in sequence. Depending on the patient's position on the operating table, CSF flow through the cannula at this point should be noticeable and may be very brisk, requiring capping the cannula or very prompt placement of the capsule implant in order to prevent excessive CSF loss. The encapsulated acclimated BHK-CNTF cells may be provided in a sterile, double envelope container, bathed in transport medium, and fully assembled including a tubular silicone tether. Prior to implantation through the cannula and into the subarachnoid space, the capsule may be transferred to the insertion Kit tray where it is positioned in a location that allows the capsule to be maintained in transport medium while it is grossly examined for damage or major defects. The tether portion of the capsule is mounted onto the stainless steel pusher by inserting the small diameter wire portion of the pusher on the membrane portion of the device and is carefully introduced into the cannula. The capsule is advanced until the tip of the membrane reaches a point that is 2-10 mm within the cranial tip of the cannula in the subarachnoid space. This placement is achieved by premeasuring the cannula and the capsule-tether-pusher assembly, and it assures that the membrane portion of the capsule is protected by the cannula for the entire time that it is being advanced into position. After the capsule is positioned within the cannula, the pusher is used to hold the capsule in position (without advancing or withdrawing) in the subarachnoid space while the cannula is completely withdrawn from over the capsule and pusher. The pusher is then removed from the capsule by sliding its wire portion out of the silicone tether. Using this method, the final placement of the capsule is such that the membrane portion of the device lies entirely within the CSF containing subarachnoid space ventral to the cauda equina. It may be anchored at its caudal end by a roughly 1-2 cm length of silicone tether that runs within the subarachnoid space before the tether exits through the dura and ligamentum flavum. The tether continues externally from this level through the paraspinous muscle and emerges from the lumbodorsal fascia leaving generally 10-12 cm of free tether material available for securing the device. CSF leakage is minimized by injecting fibrin glue (Tissel®) into the track occupied by the tether in the paraspinous muscle, and by firmly closing the superficial fascial opening of the track with a purse-string suture. The free end of the tether is then anchored with non-absorbable suture and completely covered with a 2 layer closure of the skin and subcutaneous tissue. The patient is then transferred to a neurosurgical recovery area and kept at strict bed rest, recumbent, for 24 hours postoperatively. Antibiotic prophylaxis is also continued for 24 hours following the implantation procedure. (c) implanting the encapsulated cells at an implantation site in a host, the cell property being substantially maintained following implantation. 2. The method of statement 1, wherein the encapsulated cells are exposed to the restrictive condition or conditions in vitro. 3. The method of statement 1, wherein the encapsulated cells are exposed to the restrictive condition or conditions in vivo by implantation at an implantation site in a recipient. 4. The method of statement 1, wherein the cells are xenogeneic to the host and the capsule is immunoisolatory. 5. The method of statement 1, wherein at least one restrictive condition is a glucose concentration ranging from about 40 mg/deciliter to about 70 mg/deciliter. 6. The method of statement 1, wherein at least one restrictive condition is an oxygen concentration ranging from about 40 mmHg to about 65 mmHg. 7. The method of statement 1, wherein at least one restrictive condition is a dopamine concentration which is less than the physiological dopamine concentration in cerebrospinal fluid or brain parenchyma. 8. The method of statement 3, wherein the cells are selected from the group consisting of adrenal chromaffin cells, baby hamster kidney cells, and PC12 cells. 9. The method of statement 8, wherein the cells are PC 12 cells and are implanted in a recipient for 6 months or longer. 10. The method of statement 8, wherein the cells are adrenal chromaffin cells and are implanted in a recipient for 4 months or longer. 11. The method of statement 8, wherein the cells are PC 12 cells and are implanted in a recipient for 3 weeks or longer. 12. The method of statement 1, wherein the cells produce a biologically active molecule selected from the group consisting of neurotransmitters, analgesics and growth factors. 13. The method of statement 12, wherein the biologically active molecule is at least one catecholamine. 14. The method of statement 1, wherein the capsule is implanted in a host at an implantation site selected from the group consisting of cerebrospinal fluid and brain parenchyma. 15. The method of statement 1, wherein the host is a human. (b) implanting the encapsulated cells at an implantation site in a primate recipient, the cells being xenogeneic to the recipient, for at least 6 months to establish the desired cell property in response to the restrictive conditions encountered at the implantation site. 17. The cells of statement 16, wherein the cells are selected from the group consisting of non-primate adrenal chromaffin cells, baby hamster kidney cells, and PC12 cells. 18. The cells of statement 17, wherein the cells are non-primate adrenal chromaffin cells. 19. The cells of statement 17, wherein the cells are PC12 cells. 20. The cells of statements 18 or 19, wherein the desired cell property is changed catecholamine output of the cells. 21. The cells of statement 20, wherein the desired cell property is increased catecholamine output of the cells. 22. The cells of statement 16, wherein the capsule is implanted at an implantation site selected from the group consisting of cerebrospinal fluid or brain parenchyma. 23. The cells of statement 16, wherein the host is a human. (c) implanting the encapsulated cells at an implantation site in the host, the cell property being substantially maintained following implantation. An encapsulated cell system comprising: at least one capsule, each capsule comprising a core containing a cellular source of a biologically active molecule and a surrounding biocompatible jacket, the jacket permitting diffusion of the biologically active molecule, wherein the biologically active molecule is selected from the group consisting of hormones, cytokines, growth factors, angiogenesis factors, antibodies, lymphokines, enzymes, neurotransmitters, neurotrophic factors, antiinflammatory agents, and combinations thereof and wherein the system is adapted for implantation into the aqueous and vitreous humor of the eye. The system of claim 1, wherein the jacket comprises a permselective, immunoisolatory membrane. The system of claim 1, wherein the jacket comprises a semi-permeable membrane. Use of the system of any one of claims 1-3 in the manufacture of a medicament for delivery of said biologically active molecule into the aqueous or vitreous humor of the eye. 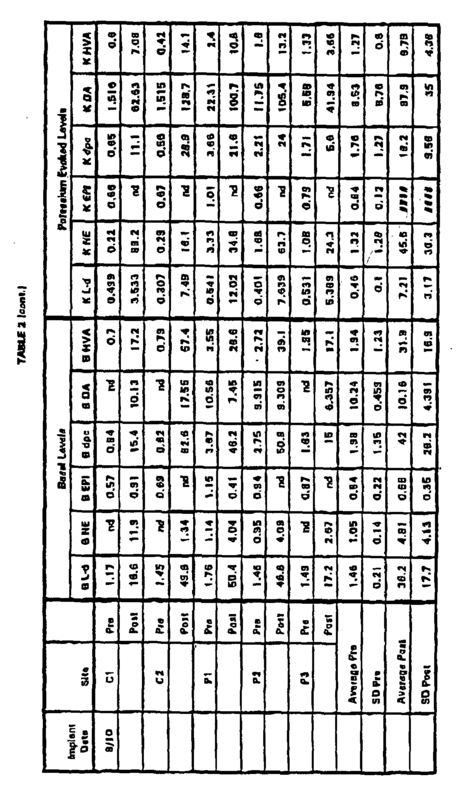 "GEIGY SCIENTIFIC TABLES", vol. I, 1984, CIBA-GEIGY, article "Units of Measurements, Body Fluids, Composition of the Body, Nutrition"
Inventor name: RUDNICK, SETH A. Inventor name: HAMMANG, JOSEPH P.
Inventor name: DIONNE, KEITH E.
Inventor name: HOLLAND, LAURA M.
Inventor name: LYSAGHT, MICHAEL J.